My personnel favourite engine is the Triumph Bonneville, I have owned quite a few, I love the torque they produce and I think they are one of the best looking engines ever made. 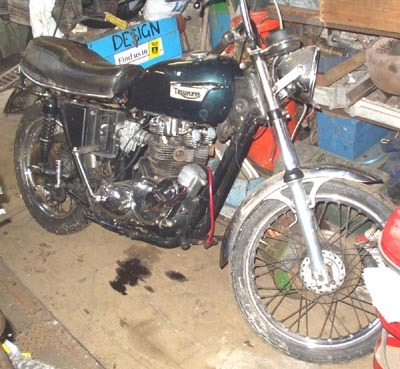 All my previous Triumph's used T140 (750cc) engines this is the first 650, a TR6 version. Below are pictures of a bike I bought to use as a "run-a-round" until I finished other projects. 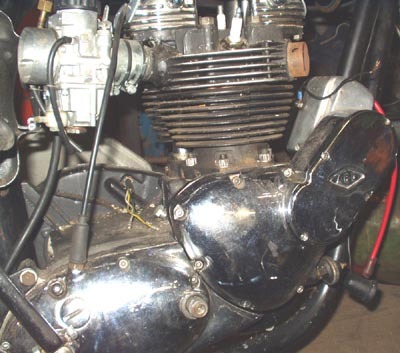 Its a TR6 engine of 1964 vintage in a 1978 T140 Oil-in-the-frame frame . I decided to strip the engine to check everything was ok and clean out the sludge trap (a must if a triumph has sat for any length of time). I got a nice surprise when I pulled the engine apart, someone had spent a lot of time tuning it. I contacted the previous owner, he told me that it was a re-import from America, where it had been used as a flat-track racer. I think the engine could have been, but it would have been used in a different rolling chasis. This changed things, the "run-a-round" became yet another project. NOTE: Pictures open in a new window when clicked on. Above, the bike as I bought it. 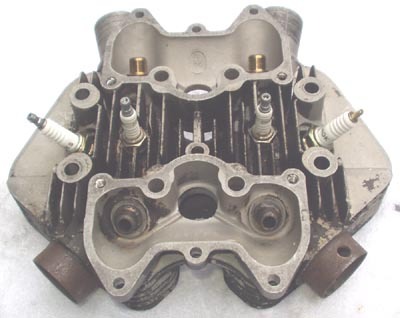 The engine came fitted with an ARD Magneto, however this would only supply a spark to 2 plugs and the cylinder head has 4. 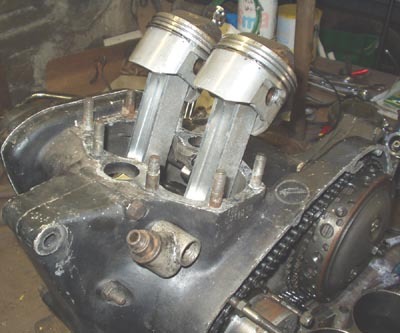 I removed the mag and fitted electronic ignition, which will fire 2 x twin outlet coils. When I lifted the barrels and seen these conrods I knew I had bought something special. 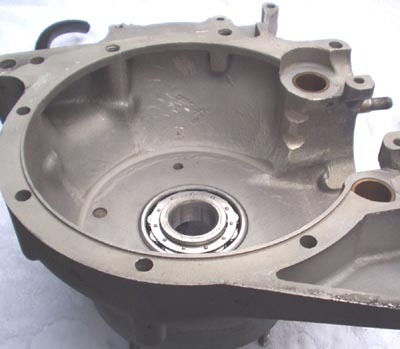 I have no idea who made them, I think they have been machined from solid billet. 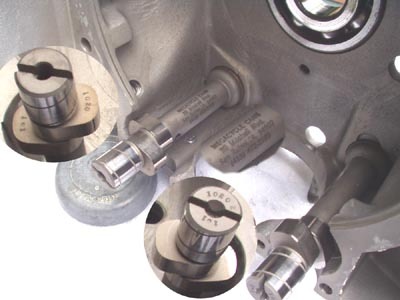 The crankcases bellow have been ground to clear the swing of the con rods. 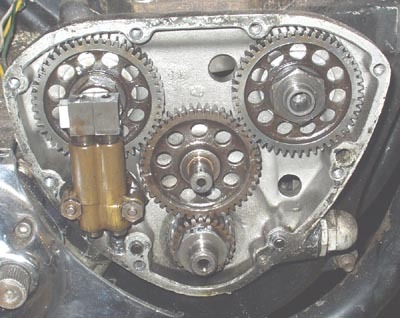 The timing gears have been drilled and lightened. Compared to standard 750 Triumph gears these feel as if they are about to float away. 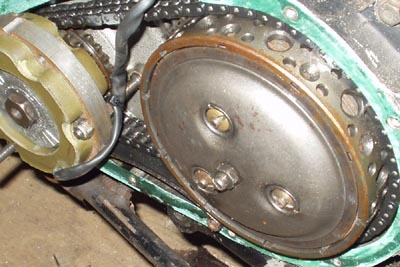 The clutch drum has also been drilled to within an inch of its life. 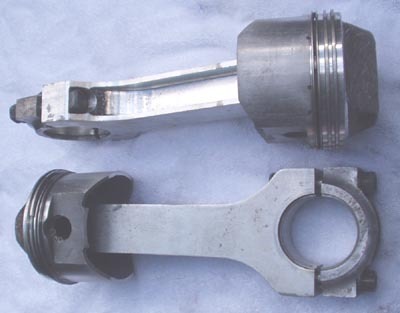 Camshafts fitted are MEGACYCLE CAMS 1020, high lift cam's with long open duration. The bores are at +60. I bought a copper gasket that is twice as thick as the standard one, to reduce the compression (I reckon it was about 12 to 1) and give a bit of clearance with the valves due to the long camshaft duration. 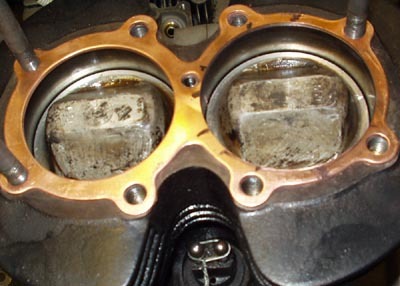 If you look at the right hand side, you can see how much material I have had to remove from the gasket so that it doesn't overhang into the cylinder. The left hand side has not yet been ground.